This listing is for a ONCE-IN-A-LIFETIME Priceless experience to roam and have fun in the outfield in a MLB Stadium, MARLINS PARK, catching and fielding a countless amount of balls hit your way during the Annual POWERSHOWCASE Home Run Derby. The Derby will feature the top high school prospects from around the country, and international. In the 10 years since its inception, the event has seen many top national and international prospects go on to play pro ball, some in the major leagues. Bryce HARPER (500ft+ HR), Anthony RIZZO , Kris BRYANT , and recent NY Met World Series participant Michael CONFORTO have all showcased their talents in past POWERSHOWCASE Home Run Derbys. So who knows whose future MLB star’s fly balls you will be catching, fielding, and watching sail over your head into the stands! 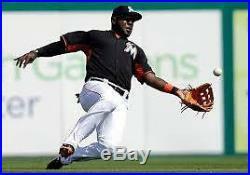 We have decided to open up the outfield and, at the same time, teaming up with the. Boys & Girls Clubs of Broward County. To donate a portion of the proceeds. But the real caviar here is being in the outfield – running, sliding, diving, running into padded walls in a real MLB stadium outfield. The experience is something that will NEVER be forgotten and is a once-in-a-lifetime type opportunity. This writer can attest firsthand. 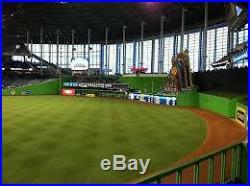 I have a love for baseball and have shagged balls at the Tropicana Dome and Marlins Park in past year’s derbys, and have had the time of my life – living a boyhood dream, running into the walls and sliding making catches and throwing the balls into 2nd base all day. We are limiting the number of spots so as to not crowd the outfield, and these spots will allow ALL DAY ACCESS. You will be able to come and go as you please, entering the field through the Marlins dugout. It will be a casual fun atmosphere, chase down whatever balls you want at your leisure. 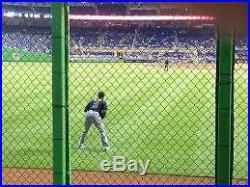 The event is being held at Marlins Park in Miami over a 2 day period on Wednesday Dec 30, 2015 from approx 12:30p til conclusion, estimated at 9-10p, and Saturday January 1, 2016, from 1 til approx 2:30, is the Finals, and it is a WIN WIN for all, as a portion of the proceeds will be donated to the Boys & Girls Clubs of Broward County. For more information about the POWERSHOWCASE Home Run Derby, visit their official site at POWERSHOWCASE. Com. For more information regarding the Boys & Girls Clubs of Broward County , visit bgcbc. 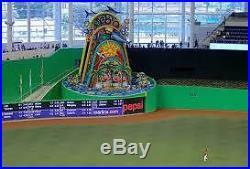 This listing is per person to have access to the field on Wednesday Dec 30, 2015 ALL DAY during the event, with the ability to come and go to the field through the Marlins dugout from approximately 12 NOON until 9:30pm. It would make an amazing, very unique gift to be treasured and remembered FOREVER, guaranteed that some participants WILL tell their grandkids one day!!!!! Contact with any questions. 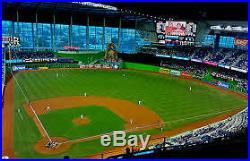 The item “Marlins STADIUM On-Field EXPERIENCE! Play outfield/Shag during HOME RUN DERBY” is in sale since Friday, December 25, 2015. This item is in the category “Tickets & Experiences\Sports Tickets”. The seller is “6powershowcase” and is located in Boca Raton, Florida. This item can be shipped to United States.